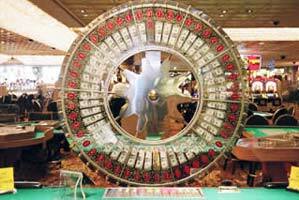 The Big Six is a famous vertical wheel usually placed in the entrance areas of the Las Vegas Casinos. It is also known as a Wheel of Fortune, or The Big Wheel, and there are some variations of a game like, for example, the Money Wheel and The Dice Wheel. The game is very simple. It was designed as a kind of distraction for players, cause it doesn't involve any skills, and offers big winnings. Nevertheless, it became very popular, and it is considered as a serious moneymaker for the casino owners. 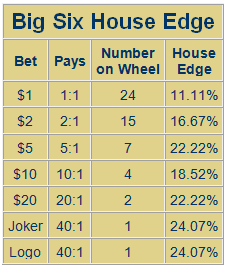 Atlantic City rules are slightly different - they offer 45:1 for joker game, so their house edge is little lower. 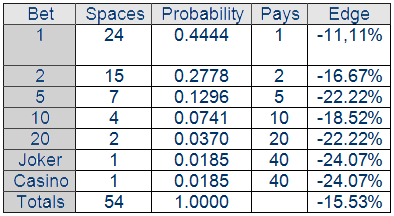 Nevertheless, the most casinos are applying the Las Vegas rules. There are some variations of a game, like Macau Big Six, which has a colors instead of money values, orange, purple etc, with logos, but it seems not to be very popular. They have a similar game also in Australia, they call it a Big Wheel, and there are some Australian animals on it.